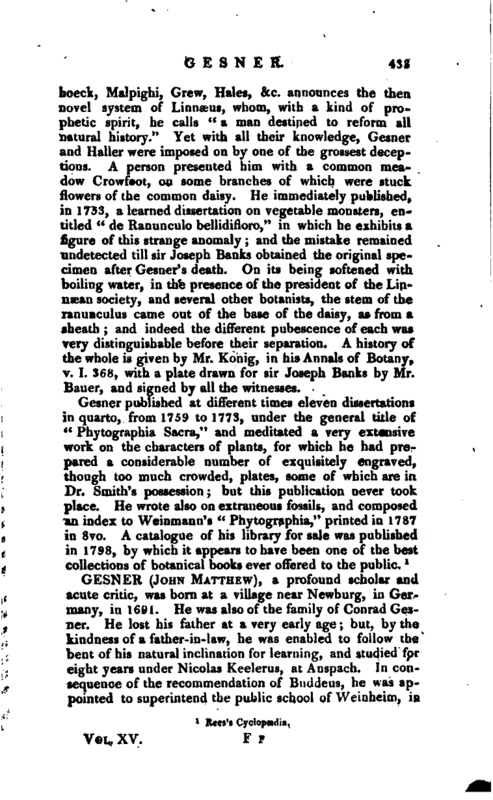 , a profound scholar and acute critic, was born at a village near Newburg, in Germany, in 1691. He was also of the family of Conrad Gesner. He lost his father at a very early age; but, by the kindness of a father-in-law, he was enabled to follow the bent of his natural inclination for learning-, and studied for eight years under Nicolas Keelerus, at Anspach. In consequence of the recommendation of Buddeus, he was ap-. pointed to superintend the public school of Weinheim, in | which character he remained eleven years. From Weinheim he was removed to a situation equally honourable, and more lucrative, at Anspach; whence, after some other changes of no great importance in his situation, he finally returned to Gottingen. Here he received the reward of his talents and industry in several advantageous appointments. He was made professor of humanity, public librarian, and inspector of public schools, in the district of Luneburg. He died at Gottingen, universally lamented and esteemed, in. the year 1761. His works of greatest importance are various editions of the classics, both Greek and Latin; and, above all, a Thesaurus of the Latin tongue, Leipsic, 1749, 4 or 2 vols. fol. which, whoever possesses, will probably not require the aid of any other Latin lexicon. 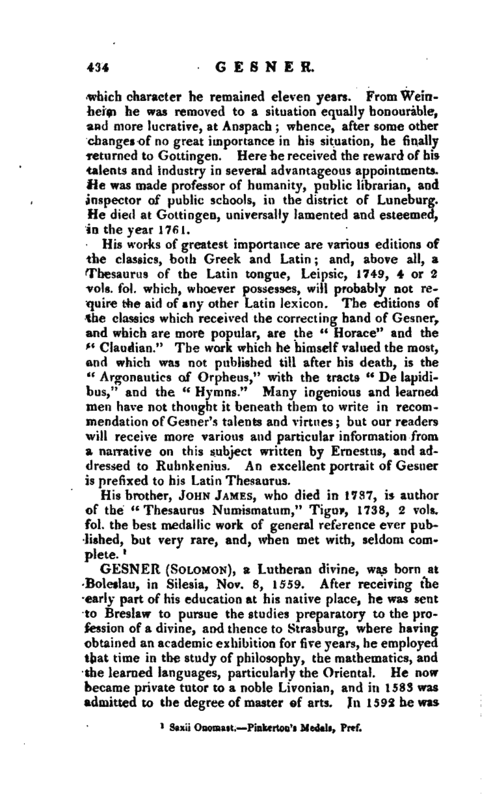 The editions of the classics which received the correcting hand of Gesner, and which are more popular, are the “Horace” and the “Claudian.” The work which he himself valued the most, and which was not published till after his death, is the “Argonautics of Orpheus,” with the tracts “De lapidibus,” and the “Hymns.” Many ingenious and learned men have not thought it beneath them to write in recommendation of Gesner' s talents and virtues; but our readers will receive more various and particular information from a narrative on this subject written by Ernestus, and addressed to Ruhnkenius. An excellent portrait of Gesner is prefixed to his Latin Thesaurus. Saxii Onomast. Pinkerten’s Medals, Pref.